Delight your family with freshly steamed dumplings. 4 How Long Does It Take to Steam a Yam? Whether you are creating a side dish, main course or appetizer, dumplings can fit the bill. 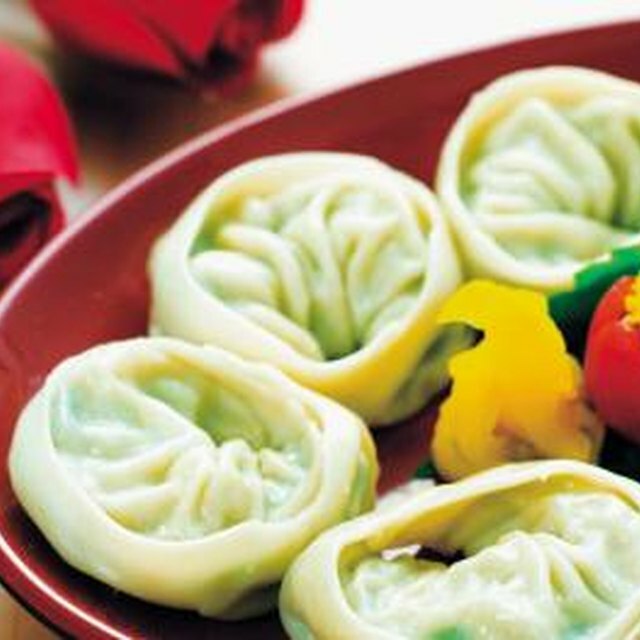 Dumplings can be filled with a variety of foods from various Asian, American and European cultures, including seafood, vegetables and meats. There is no rule on what you can place in the center of your dumplings. Some cooks even craft dessert and fruit dumplings. As with filling dumplings, there is no set rule for cooking these tasty treats. One common method of preparation involves steaming, a process that helps seal in the flavors of the dumpling fillings. Steam your dumplings after pan frying them. This method is attractive to cooks who don't have a bamboo or other kind of steamer. Begin by pan frying your dumplings according to your recipe. Add enough water to the frying pan cover the lower half of your dumplings. Reduce the heat level under your pan to a medium flame. Allow dumplings to steam in this manner until the added water evaporates. Prepare a batch of dumplings according to your recipe. Place a layer of parchment paper into the bottom of your bamboo steamer. Organize the crafted dumplings in a single layer on top of the parchment paper and steam for approximately nine minutes. Put your bamboo steamer into a pan or wok that has just enough water in the bottom to cover the bottom level of the steamer. The water should not touch the food in your steamer at any time. Allow the dumplings to steam over a medium-high to high heat level for approximately nine minutes or as indicated by your recipe. Consult the manual of your particular bamboo steamer for specific directions. The Kitchn: How Can I Steam Dumplings Without a Bamboo Steamer? Charmiane Wilson's writing career began in 1992 as a contributing reporter and writer to "Hollywood Beat" entertainment magazine. This position lasted until 2005, when she returned to her passion of writing fiction. Her novel, "A Series of Prayers," was published in late 2008. She holds an associate degree in business from Axia College. Can You Make Dumplings With Corn Starch?